Civil conflicts have been recurring events in recent human history, despite the immense cost to people and societies. According to the Uppsala Conflict Data Program , more than 200 civil conflicts have broken out since 1945. Roughly one-third of these took place in Africa, most of which were ethnic conflicts (Wimmer et al. 2009). Although each conflict is the result of a complex combination of factors, researchers and policymakers have tried to identify common determinants to help them create more effective conflict prevention and conflict management tools. There is a lively debate, for example, about the role of inequality as a trigger of violence. According to relative deprivation theory, individuals feel discomfort whenever, comparing their situation to others, they realise that they have less than those around them (Gurr 1970). The resulting anger and grievance could fuel violence and conflict. Early empirical studies, however, found little support for the link between inequality and civil conflicts (e.g. Fearon and Laitin 2003, Collier and Hoeffler 2004). 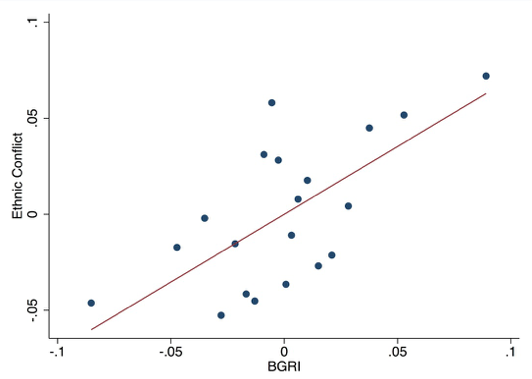 These studies mostly relied on cross-country comparisons, and used the standard country-wide Gini index to measure inter-personal ('vertical') inequality. Civil conflicts, however, are typically fought between groups. More recent studies have therefore shifted their focus on measures of inter-group or 'horizontal' inequality. They typically define the groups along ethnic or religious lines. There is a lack of data to construct these inequality measures, and this is the main challenge in this case. So far, research has mostly relied on sporadic survey data, or has resorted to proxies such as nightlight density, or digital maps of economic activity, which are only available for a limited number of years (e.g., Østby 2008, Cederman et al. 2011, Huber and Mayoral 2013, Kuhn and Weidmann 2015). Also, apart from Morelli and Rohner (2015), there has been little discussion about the endogeneity of inequality. These constraints are likely to be the origin of the mixed results these studies obtained. In recent work, we empirically investigate whether inequality between ethnic groups affects ethnic conflict prevalence in the African continent between 1982 and 2001 – the period for which our main data sources were all available (Guariso and Rogall 2017). The analysis is based on an innovative rainfall-based measure of inequality between ethnic groups. Our approach uses the observation that agriculture employed most people in Africa, and at the same time has been highly dependent on weather conditions.1 Variations in rainfall are therefore likely to lead to variations in agricultural production and income. The link between rainfall and income across Africa has already been highlighted, starting with Miguel at al. (2004). To the best of our knowledge, however, we are the first use this to investigate the role of inequality. Using weather data, we can overcome both issues of data availability – as high-frequency data are systematically collected for the entire continent – and endogeneity – as changes in the distribution of rainfall are not caused by conflict. 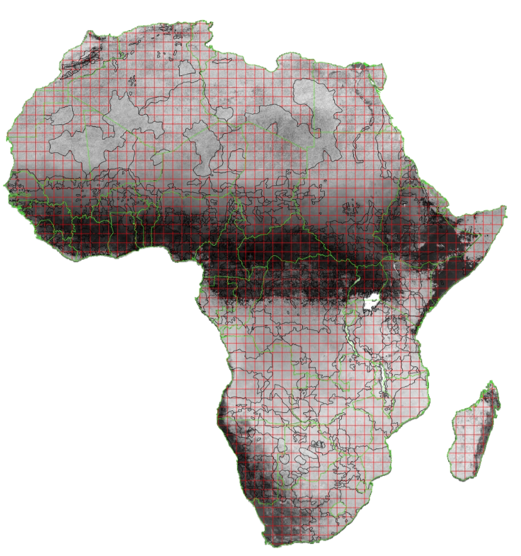 To generate our dataset, we combine an administrative map of Africa with the Geo-Referencing of Ethnic Group (GREG) map, which records the homelands of ethnic groups. We then added high-frequency rainfall data in gridded format, provided by the European Centre for Medium-Term Weather Forecasting (ECMTWF).2 Finally, we use bi-weekly satellite images of the greening of the land surface to estimate the growing season across the continent. This allows us to compute, for each area, the amount of rainfall during the growing season. This is the period that matters the most for agricultural production and therefore for income. Figure 1 shows how we constructed our dataset. We validated our rainfall measure against information on country-level agricultural output, as provided by FAO, because there was no disaggregated data. We find, as expected, that more rainfall during the growing season leads to significantly higher agricultural production, while rainfall outside the growing season does not have this impact. We modelled our Between-Group Rainfall Inequality measure on the standard Gini coefficient and capture, for each year, inequality in the distribution of rainfall during the growing season among ethnic groups living in the same country. The empirical analysis at the country level indicates that Between-Group Rainfall Inequality has a large and significant impact on ethnic conflict prevalence, summarised in Figure 2. The results suggest that a one-standard-deviation increase in rainfall inequality across the sample leads to a 16 percentage points increase in the risk of ethnic violence in the country. The result is robust to placebo tests and robustness checks. When we re-construct the inequality measure using rainfall outside the growing season, we observe no effect at all. To understand the mechanisms behind our result, in the second part of the research we investigate the role played by the distribution of political power among the ethnic groups who were differently affected by the changes in rainfall. In doing so, we exploit the information contained in the Ethnic Power Relations (EPR) dataset . Among other things, the dataset allows us to identify which ethnic groups are involved in the conflicts, as well as the distribution of political power among them. Our results indicate that the relationship we identify between rainfall inequality and ethnic conflicts strongly depends on the distribution of power among ethnic groups. More specifically, we find that an ethnic group is more likely to be involved in an ethnic conflict whenever it experiences a drop in rainfall with respect to the leading group in the country, defined as the ethnic group with the most political power. The result is driven by groups completely excluded from power, and is strongest for groups that have recently lost power. Finally, we find that variations in the distribution of rainfall, with respect to the leading group, matters more than variations in local rainfall conditions in the excluded group’s homeland. Combining results at the country and ethnicity level, our analysis indicates that a more unequal distribution of rainfall increases the risk of ethnic violence whenever it penalises ethnic groups with no access to power. With the data that we used, we were not able to isolate the exact mechanism, but our findings suggest that rising grievances in the excluded group would play a significant role. Our results provide a novel contribution to the long-standing debate about the role of inequality as a determinant of civil conflicts. By relying on a new exogenous measure, we have been able to provide clear evidence of the causal link. At the same time, we acknowledge that our analysis focuses on the reduced-form effect of changes in rainfall on conflict prevalence. Although we did our best to isolate the component of rainfall that matters for income, we cannot fully rule out the presence of additional channels. If there is better data in the future, it will hopefully allow research to dig deeper into causality. Our work also contributes to the fast-growing literature on climate and conflict by showing the importance of changes in the distribution of weather-related variables within a country, in addition to their local impact. As weather variability associated to climate change increases, this is a warning signal. It suggests that investments in agricultural resilience have the potential to lower conflict prevalence as well. Finally, our analysis provides evidence that the link between inequality and conflict strongly depends on the power relations among ethnic groups, and suggests that political relationships can be a powerful tool for settling ethnic tensions, and for mitigating the risk that rising grievances degenerate into armed violence. This paper is funded under the grant “Policy Design and Evaluation Research in Developing Countries" Initial Training Network (PODER), which is funded under the Marie Curie Actions of the EU's Seventh Framework Programme (Contract Number: 608109). Cederman, L E, N B Weidmann and K S Gleditsch (2011), “Horizontal Inequalities and Ethno-nationalist Civil War: A Global Comparison”, American Political Science Review, 105(3): 478-495. Collier, P and A Hoeffler (2004), “Greed and Grievance in Civil War”, Oxford Economic Papers, 56(4): 563-95. Fearon, J D and D Laitin (2003), “Ethnicity, Insurgency and Civil War”. American Political Science Review, 97(1): 75-90. Frenken, K (2005), “Irrigation in Africa in Figures: AQUASTAT”, FAO publication, Rome. Guariso, A and T Rogall (2017), “ Rainfall Inequality, Political Power, and Ethnic Conflict in Africa ”, LICOS discussion paper 391/2017. Gurr, T R (1970), Why Men Rebel, Princeton, NJ: Princeton University Press. Huber, J D and L Mayoral (2014), “Inequality, Ethnicity and Civil Conflict”. Barcelona GSE Working Paper 744. Kuhn, P M and N B Weidmann (2015), “Unequal we fight: The impact of economic inequality within ethnic groups on conflict initiation”, Political Science Research and Methods, 3(3): 543-568. Miguel, E, Satyanath, S, and E Sergenti (2004), "Economic Shocks and Civil Conflict: An Instrumental Variables Approach", Journal of Political Economy, 112(4): 725-53. Morelli, M and D Rohner (2015), “Resource concentration and civil wars”, Journal of Development Economics, 117: 32-47. Østby, G (2008), “Polarization, Horizontal Inequalities and Violent Civil Conflict”, Journal of Peace Research, 45(2): 143-162. Wimmer, A, L E Cederman and B Min (2009), “Ethnic Politics and Armed Conflict: A Configurational Analysis of a New Global Dataset”, American Sociological Review, 74(2): 316-337. According to the World Bank, still in 2008 more than 65% of the labor force in Sub-Saharan Africa was employed in agriculture, while in 2005 less than 7% of cultivated land in the region was irrigated (Frenken 2005). We relied on the ERA-40 dataset, which provides re-analysis of weather data, obtained through a climatic model that harmonises information from a variety of primary sources. The dataset provides rainfall information at six-hour frequency from 1958 until 2001 and at a 1.25 degree resolution (corresponding to about 140 square kilometers at the equator).